"It's a very serious storm, but it could hit anywhere in North Carolina, so where are we going to run to?" WILMINGTON, N.C. — As the winds kicked up, with rain on the way, Mickey Gentry hurried to finish securing his 85-year-old house from the violent storm looming off the coast. Gentry, a construction worker, has lived here in the Wilmington area since 1968, through dozens of hurricanes and historic wreckage. He fled one storm — Hurricane Fran in 1996 — and regretted it, because it took him days to get back home. And so on Thursday, with Hurricane Florence hours from arrival, Gentry boarded up his windows, filled up his bathtub, pulled out his camping stove, rounded up his wife's six cats and set about "storing things away like a squirrel." 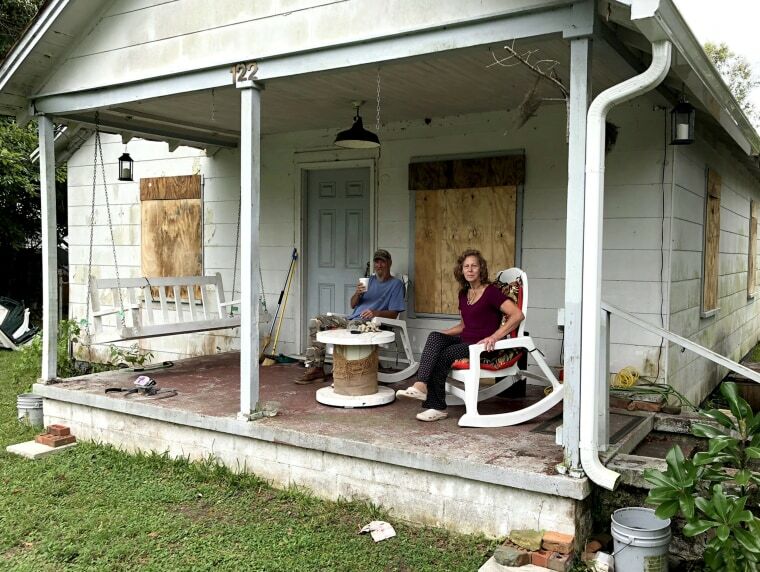 Riding out a storm is not for the faint of heart, Gentry, 64, said from his porch in the city's Hightsville section, pausing to sip a Clamato-and-Budweiser "chelada" from a Styrofoam cup. "The noise, that whistle of the wind, it will drive you crazy," he said of the hurricane gusts. "It will wear on your psyche. It still spooks me." Anyone with the will and the means to leave Wilmington was already gone by Thursday. Behind are thousands of holdouts like Gentry, who, either by choice or necessity, were holing up and waiting for Florence to arrive. "It's a very serious storm, but it could hit anywhere in North Carolina, so where are we going to run to?" said Darryl Crawford, a retired paper factory worker in the city's Northside neighborhood. He spent Thursday watching weather reports on television behind boarded windows. He and his wife have family in Florida and in New York, but could not afford to go to either state. "So we'll stay home and stick it out," Crawford said. Wilmington, a city of 117,000 in southeastern North Carolina, is in Florence's direct path, with landfall expected around sunrise Friday. The slow-moving storm is expected to linger over the area, with hurricane-strength wind gusts lasting up to 17 hours — and tropical storm-strength gusts lingering for days more. It could also bring record rainfall (up to 40 inches), storm surges (up to 9 feet) and widespread flooding — not only on the coast but also along the Cape Fear River and its inland tributaries, according to meteorologists. By Thursday, anyone who wanted to evacuate the city had probably run out of time, Mayor Bill Saffo said. "At this point in time, with the wind starting to come in now, I think it's too late," Saffo told MSNBC. "The window has closed." Just north of Wilmington, in the semi-rural community of Castle Hayne, Amelia Mason made plans to stay in a 1920s farmhouse so she could look over a restless collection of animals. She is the director and founder of SkyWatch Bird Rescue, a nonprofit sanctuary for chickens saved from cockfighting, geese and ducks with deformed wings, injured owls and hawks, as well as donkeys and horses set free from slaughter. Many of the animals were at extreme risk of drowning. Volunteers had taken some home, and Mason had successfully arranged for inland sanctuaries to pick up others. "But we're not going to get them all out," Mason said. The property, a former flower farm on the Cape Fear River basin, was prone to flooding. The remaining horses and donkeys would be left to roam. She planned to bring as many at-risk birds — some hawks, an owl, a vulture, "special needs" parrots" and "the gimpier" ducks — that would fit into the farmhouse's second floor, where she'd stay during the storm and its aftermath. "I think we've done more prep for the animals than we've done for ourselves," Mason said. Nearby, at an automated roadside ice vending machine in Wilmington, Hanne Goodwin waited in line with her husband and her 10-month-old son. They have family in Myrtle Beach, South Carolina, but it, too, was expected to be hit by Florence. "Anywhere we go, we're in the path," she said. Dawn Allen remained at home in Wilmington, but not fully by choice. She can't afford to find a place to live temporarily, and suffers from autoimmune disorders that prevent her from going to a local shelter. "It's a sad situation that so many are put in," she told MSNBC. "To have to pick whether you leave or you stay and you risk everything." To Gentry, the decision to stay put was simple. "I've turned tail before, and I couldn’t get back," he said. But he has no illusions that riding out the storm will be easy. The howling wind. The pounding rain. Days or weeks without power. "It's for the fittest, I'll tell you that," said Gentry.